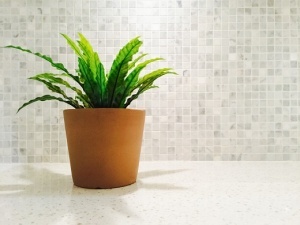 If you having been browsing Pinterest or home improvement websites to get inspiration on how to beautify your kitchen, you likely have noticed the installation of backsplash as a recurring theme. Whether its subway tile or glass tile, it’s no secret that including this protective layer on your wall can create a modern and clean look. However, there are more than just aesthetic benefits when you complete your perfect kitchen project with a backsplash. Keep Your Kitchen Clean – One problem many homeowners face in their kitchen, is keeping their walls clean from messy foods during cooking and grease splatter. When you utilize a tile wall cover, you have an easily cleaned surface that requires little effort to maintain. In some instances, this can be extended all the way to the ceiling for added protection. Pest Prevention – Pests can easily make their way through drywall, sometimes creating their nets inside of gaps. However, when you install tile on top of this drywall, you create a solid surface that remains sealed. This simple fix can help reduce the chances that you will have pests in your kitchen. Water Resistance – Most tile is water resistant, making it great for a protecting your walls from water damage that may occur near the sink. Furthermore, most of the tiles that are used during the installation will be sealed for added water resistance. Including tile paneling in your kitchen renovation is a great way to decrease the likelihood of your walls sustaining water damages.